Like to know more about how Easy Bill Pay takes the hassles out of paying bills? Here are some FAQ’s about the Easy Bill Pay payment service. What is Easy Bill Pay and how does it work? You identify the bills you want to pay and nominate your method of payment: bank account or credit card or debit card. We do the rest. Easy Bill Pay can pay any bill that can be paid by BPAY, bank transfer or cheque! Easy Bill Pay does most of the work for you. All you need to do is to upload your bills and review the added bill details. We will transfer the funds to pay for these bills in accordance with your chosen method. You can choose from two easy methods. You can either choose that we will take a top-up payment prior to each of your bills coming due, or you can use our convenient Bill Smoothing method where Easy Bill Pay will calculate a reoccurring top-up amount for you. We will take all the hard work out of bill paying but you still keep all the control. Easy Bill Pay is FREE apart from surcharges incurred from credit and debit card use. However, this surcharge will only apply in the months where you have made top-ups of more than $1000. What is the Credit Card surcharge and how does it work? The credit card surcharge only applies to top-ups made using a credit card and debit card and it will only apply after you have made top-ups of more than $1000 in a calendar month. If for example, during a calendar month, you make top-ups using your credit card of $1,600, then the surcharge will only apply to the $600.00 and the rate is 0.8%. In this example the credit card surcharge will be $4.80. The surcharge does not apply to bank transfers or payments made by Easy Bill Pay to pay for your bills. Your monthly $1,000 limit will be calculated on calendar month cycles and will reset on the 1st of each month. What do I do if I want to stop using Easy Bill Pay? You can cease using Easy Bill Pay at any time – there is no contract. Any funds in your account will be refunded back to you within three business days. I have all sorts of bills – what can I do? We have a few alternatives for this, and you can choose which one works best for you! If your bills are ongoing and the amounts do not change, you can simply add the bill frequency and the amount you want to pay for the bill, and we will make sure all payments are made on time. If the amount varies each bill (i.e. 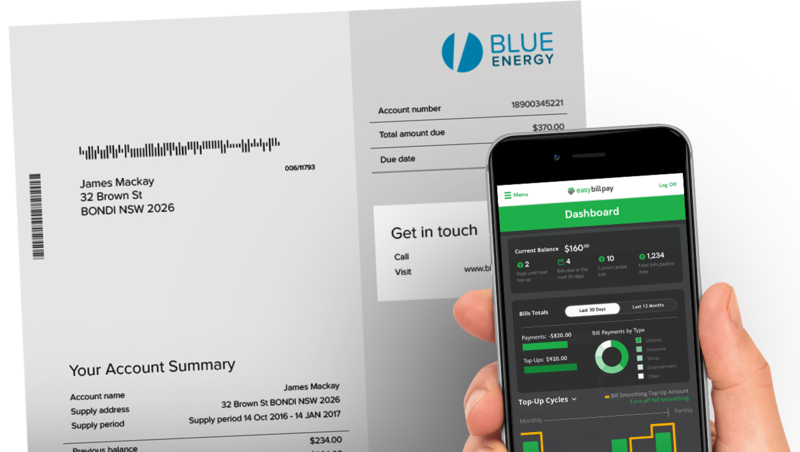 an electricity or phone bill) you can contact your provider and nominate us to receive your bills using your own personal Easy Bill Pay email address or you can simply upload the bill onto your Easy Bill Pay account as you receive the bill. We understand you may have unexpected or one-off bills, like a payment owing to your friend for a night out, or an unexpected veterinarian bill. Easy Bill Pay can also be used for all those bills that pop up. Just take a picture of the bill on your mobile, or upload the bill to your account and we will make the payment! What if I dispute my bill? You are still responsible for verifying the accuracy of your bills and should contact your biller immediately if you believe there is an error in the amount you have been charged. Some months I get a lot of bills - what can I do? You can add one-off bills as you receive them, either by uploading the bill to your account, or forwarding it to your Easy Bill Pay email address or by adding the details manually. This will adjust your top-up amount accordingly. How can Bill Smoothing help me? Throughout the year, your bill amounts can fluctuate which may cause financial stress in situations where unexpected quarterly/yearly bills come due. With Bill Smoothing, you will pay the same amount every pay cycle making your finances more manageable. Bill smoothing is a smart way to relieve you from this stress and help you budget more effectively. How are Bill Smoothing payments calculated? Bill Smoothing looks at all your bills for the next year and calculates the top-up amounts needed to ensure all these bills are paid on time. Your payments won’t fluctuate and it’ll be one easy to remember amount each pay cycle. What is my primary funding account? We will top-up your Easy Bill Pay account from your first selected funding source. This is your primary funding account. This depends on your preference. Either, we can transfer your payments two business days before your bill comes due. Or, you can activate Bill Smoothing and Easy Bill Pay will transfer payments on either a weekly, fortnightly or monthly cycle. The choice is yours. This allows you to select a payment cycle which best suits your own financial position. Can I make an extra top-up payment? Yes, you can add funds onto your Easy Bill Pay account through BPAY or direct transfer. We will hold these funds for you to make payments towards your future bills. What happens if my top-up payment fails? If this happens we will inform you immediately. If you have provided us a secondary funding source, we will attempt to transfer the payment from here. If you have not provided us with a secondary funding source, or if your secondary funding source fails as well, we will contact you to schedule a top-up payment so all your bills can be paid on time. In the meantime, we will continue to make payments towards your billers with the funds still available. Can I withdraw from my Easy Bill Easy Account? Yes, you can withdraw any funds from Easy Bill Pay that are not being held to pay your bills. This can be done using the withdrawal function. If you need more funds back, you can pause a bill and the funds being held to pay this bill will be available for you. What types of accounts can I deposit a withdrawal into? You will need to select a bank account to deposit a withdrawal into, as we cannot refund onto credit cards. You can refund to any pre-nominated bank account that has been linked to your EBP account. Alternatively you can add a new bank account for the refund. Your Dashboard is a snapshot of your account. It shows your payment activity, recent bills, quick stats and numbers around your bills, scheduled top-ups and more. How can my Dashboard help me budget? Your Dashboard is designed to keep you up to date on what your Easy Bill Pay account has been doing, and what’s ahead so that you can plan around them, manage your finances and avoid any surprise payments. Can I view a history of my bills? In your account on the History page, you can see an overview of all bills that have been paid through Easy Bill Pay. You can also see a history of your bills in the Bills section of the site. Can I view a list of my upcoming bills? The Bills page will show you an overview of your bills including your next few upcoming ones. To see a comprehensive list of all upcoming bills, click or tap on the ‘Upcoming’ tab. Can I view a previously paid bill? You can see all your paid bills on the Bills page. To see a comprehensive list of all previously paid bills, click on the ‘Past’ tab. How secure is Easy Bill Pay? Your login user name and passwords are stored securely in a separate database using multi-layered hardware and software encryption. We only store the information needed to save you the trouble of updating, syncing or uploading financial information manually. How can I protect my Easy Bill Pay account? Keep your passwords safe–don’t share it with anyone. Mix it up–make sure that your password includes numbers and capital letters. Use virus protection and a firewall on any computer you use to access EBP. Learn what you can do to help prevent identity theft and identify phishing attempts. I lost my phone – what should I do? EBP enables you to manage the mobile devices associated with your account. You can remove mobile access to your account, change your password, or delete the account entirely.